This LED Vapor Tight fixture from Maxlite consumes only 50 watts of energy and has a brilliant light output of 6400 lumens. It produces enough light to replace a 150 watt HID. This fixture is designed for use in Gas Station & Convenience Stores, Parking Garages, and Stairwell lights. It is UL Listed and RoHS Certified.. 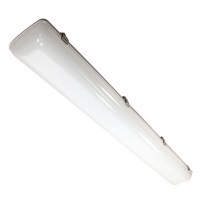 This fixture has a long average lifetime rating of 50,000 hours and is white in color (4000K).